Just in time for March madness! 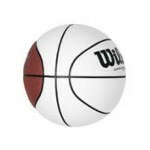 These two-toned white and brown basketballs are perfect for those prized autographs from your favorite players. They make the ideal addition to any sports fan’s collection. These Wilson brand collectibles are available in the official size as well as miniaturized, making them perfect for any trophy case.